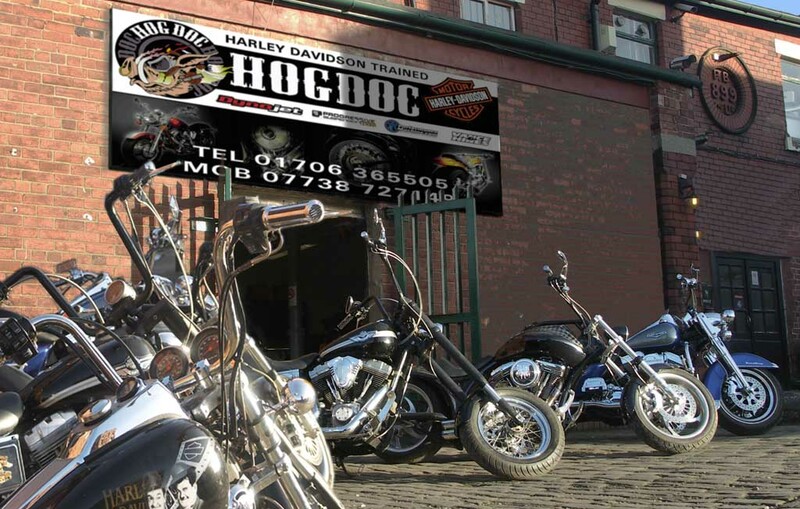 Hogdoc Motorcycles | Specialist motorcycle building, servicing and repairs. Welcome to Hogdoc Motorcycles in the Northwest of England. We provide Custom Motorcycle building, can Customise your motorcycle or supply and fit accessories. We also service and MOT all makes of motorcycle. We specialise in all work on Harley-Davidson motorcycles and have all the equipment necessary to ensure that you get the most from your Hog! So if you need any of the items below either give us a call on the number at the top of the page or use the contact page to drop us a line. Alternatively check out the visit-us page to get more information and then call and see us. Accessorise your bike - we can provide and fit the parts (we'll also help you choose them)! Service your bike - any make! You can be sure we'll treat your bike like it's our own and treat you with respect as our customer. Many do not sell direct to the public. Please contact us for the best prices and help with choosing. Have the unique bike you always wanted. Motorcycle servicing and MOTs carried out with competitive pricing. Maximise your performance and prove it!